Our history goes back with time in 1998. MagicCo Life Care Products held the decision and promoted the vision of Mr.Siby Mathew. The founder believes that there is a need to bring the people to the world of Eco – Friendly products..
We believe in nature. First we started a distribution agency called Masscare Marketing. In the beginning it was a humble unit that distributed ayurvedic products. Later we started the production of Tender Coconut Chips. The technical support of the production of the Tender Coconut Chips was from the Central Plantation Crops Research Institute ( CPCRI) at Kasaragod. CPCRI also gave the technical support to the production of Virgin Coconut Oil. 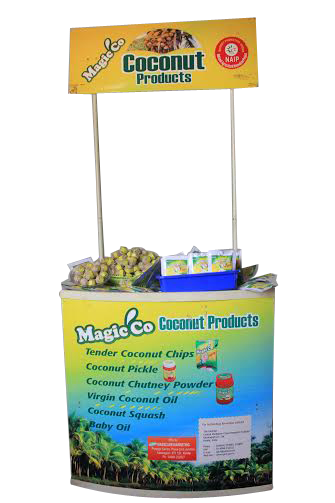 At present we are into the manufacturing and marketing of – Tender Coconut Chips, Coconut with dry fruits laddu, Virgin Coconut Oil and Massaging Oil for all. MagicCo Life Care Products are devoted to enhance people`s life by offering tasty and healthy products.We do our best to create a greater choice of tasty, healthy, affordable and safe products.We assure the highest quality to our products. We are committed in providing fresh natural products free from artificial colours, preservatives, chemicals and additives. All our products are processed naturally. MagicCo can assure 100% hygiene in quality, in manufacturing, packaging and shipping of all our products.We also ensure 100% hygiene in quality ingredients selection and process operation. We work hard to gain your trust in MagicCo Life Care Products.